It's Broni here with you today. This past Saturday my daughter and her children, ages 7 and 4, spent the night with me and we colored all evening and most of the day Sunday! What was their favorite image to color? My brand new Follow Your Heart stamp by Catherine Scanlon! I have to say that I agree with them! 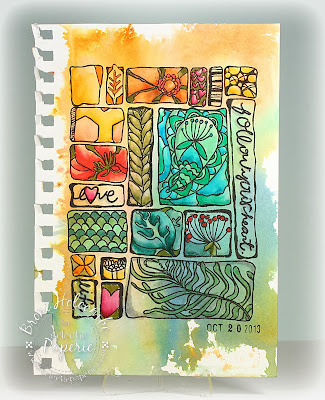 I've had this idea since I first saw the stamp….to douse a page with watercolors, stamp the image, then fill in some details with color. So that's just what I did! I pressed 6 different colors of Distress inks into my craft sheet and spritzed it thoroughly with water. Then I laid my page on it, picked it up,and spritzed the page with more water. I held it vertically and let some of the ink run down the page. Then I dried it completely using my heat gun. I stamped the image in black ink, then I used my Tombow water color markers to color in and shade some of the areas, and a water brush to blend. I did go over some of the lines with more black ink to make them stand out more. We all had fun coloring, and I can't wait to try some different techniques using this great image! love this technique and the fab results ! !very artsy !! Beautiful, Broni! Catherine will love seeing your page!! 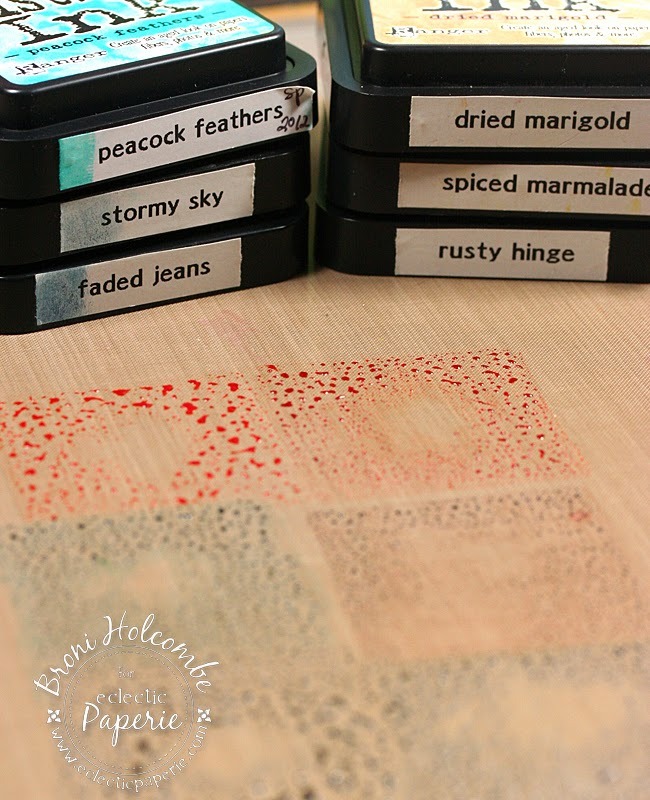 Great stamp and great results! This is gorgeous Broni girl! I really like how this turned out!! Absolutely vibrant. LOVE all the color!!!!! 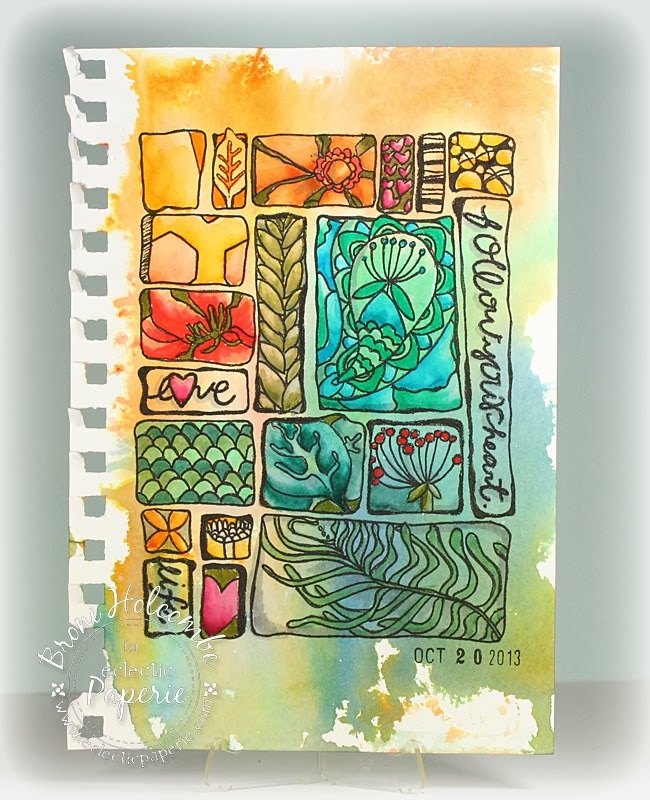 I've been eyeing her stamps, and will definitely add these to my stash. Gorgeous page and I bet you guys had fun!!!!! That sounds like fun! What a great idea and a great stamp! Such a beautiful result, Broni! I love this! LOVE this image and LOVE your technique! This turned out so Wonderful! THX for the technique inspiration, Broni!